Summer has begun! Yes, and that’s reason enough to celebrate. For some that means fun in the sun at the beach, but for others, especially foodies, that means its barbecue time! Sure, it’s pretty much always barbecue weather in sunny Southern California but during the summer you really have to step your BBQ game up. And there’s no better and easier way to be the king of your neighborhood barbecue than by grilling Memphis style. Or grilling meats from Memphis, Tennessee to be exact. Yup, getting Memphis BBQ sent directly to your backyard grill is easy and affordable, and delicious. And Memphis delivers! Because FedEx is a Memphis Superhub, several Memphis restaurants will ship anywhere in the country overnight—often for free. In case you don’t know, Memphis-style barbecue is one of the four predominant styles of barbecues in the USA—the other three being Carolina, Kansas City and Texas. No offense to any of the other barbecue regions but Memphis is my favorite. Memphis-style is slow cooked in a pit and can be prepared “dry” or “wet”. 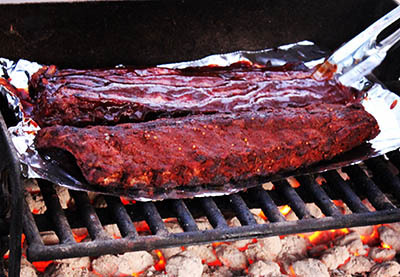 Dry ribs are covered with a dry rub made up of salt and various spices while wet ribs are brushed with sauce before, during and after cooking. While Memphis (aka Bluff City) is Home of the Blues and the Birthplace of Rock ‘n’ Roll, it’s not all Elvis and Beale Street. It’s actually more than just barbecue but we’re talking some of the country’s best barbecue so, um, let’s talk barbecue! Did you know there are more than 101 barbecue joints in Memphis? It is BBQ City (that’s my term not the city’s) after all. From wet or dry, slab or pulled, hot or mild, tangy or sweet there’s a style of barbecue for every taste. If you’re looking for dry rub, I say look no further than Charlie Vergo’s Rendezvous, which has been delighting meat eaters since 1948. A short walk from the famed Peabody Hotel, the restaurant entrance is in an alley on the basement level but fear not, it’s BBQ heaven! 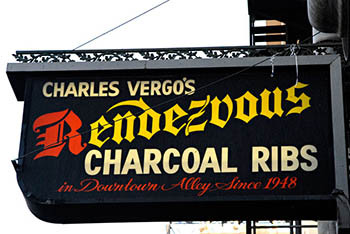 At Rendezvous we’re talking charcoal-broiled barbecue. 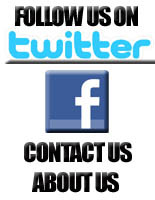 Order for delivery without worry as all items are fully shipped cooked and frozen, vacuum sealed and packed with dry ice and frozen gel packs. 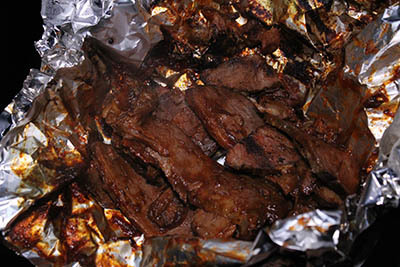 Delicious barbecue can arrive as early as the very next day. Dry rub is very much a Memphis thing so you’ll be hard-pressed to find any better than Rendezvous. 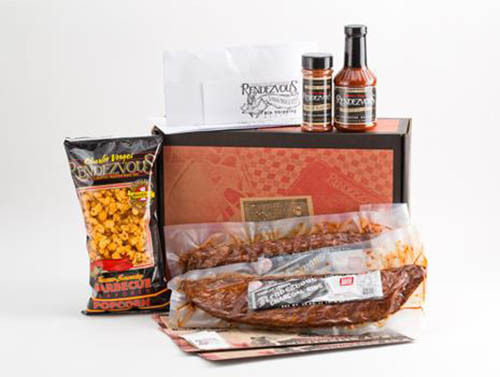 Order two slabs of ribs for $99 and that comes with seasoning, popcorn, and the world-famous Rendezvous barbecue sauce. Let me tell you, while it may not sound like much, but popcorn with dry rub is a delicious starter item. It’s a Memphis tradition and a terrific sharable appetizer. And it doesn’t just end there, as four pounds of pork shoulder will also run you $99. Pork shoulder and ribs, now that’s a feast! And the mustard baked slaw is a great side dish too. 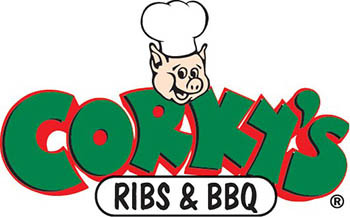 Now if you’re looking for “wet” barbecue, which is more what we’re used to, then look no further than Corky’s Ribs & BBQ. Corky’s also ships anywhere in the U.S. In addition to barbecue pork, chicken and beef, you can also order their sauces and rubs. Wet barbecue doesn’t really get any better than Corky’s and The Ultimate Taste of Corky’s package for just under $100 is the way to go. 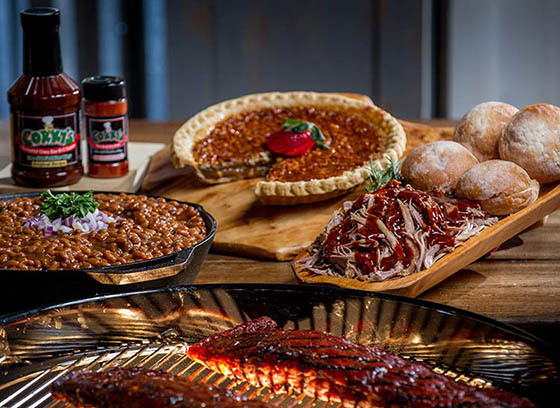 It includes one slab of ribs; one pound of pork shoulder, beef brisket or pulled chicken or one BBQ chicken half; one 18oz bottle of Corky’s original, honey, smokin’ hot or apple BBQ sauce; one 2.5oz bottle of Corky’s dry rib seasoning; 1 pint of BBQ baked beans; and one fudge or pecan pie. Let me tell you, the beans are sensational. And I say get the pecan pie! Warm it on the grill, pile on some vanilla ice cream on top and the most welcome food coma of your life will ensue followed by shear bliss. Other Memphis barbecue institutions include Central BBQ, Nothing Beats Bluff City BBQ, Jim Neely's Interstate Bar-B-Que, and Germantown Commissary. But Rendezvous and Corky’s each have a special place in my foodie heart. We’re talking sensational and savory meets; loaded with flavor. But the pre-cooked meat on the grill and life doesn’t really get any better. 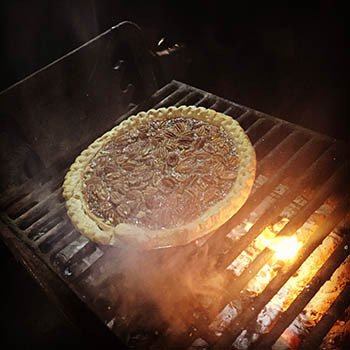 This summer, get your Memphis BBQ grill on and enjoy.